Disclaimer: I am an employee of Chicago Public Schools (CPS). Any opinions expressed here are my own and do not reflect the opinions of my employer. I’m happy to see Senator Durbin (who I met in October) already taking action within hours of the story breaking: Durbin asks USDA to help reduce school lunch fraud risk. Fraud and corruption cannot be allowed to continue. The National School Lunch Program (NSLP) doesn’t have the money to let this go on. As it currently stands, some kids who have the money to pay for school lunch get it for free. There needs to be more oversight in the administration and eligibility in the program. What are your thoughts? That there are more people getting free lunch than food stamps is no surprise. The amount of stigma associated with FS is HUGE. Other studies show that many people who qualify for FS don’t apply, either because they don’t know they can or because they’re too ashamed. There are other reasons the free lunch will always outpace FS recipients, and that’s because of the way they calculate income for families and fail to include SSI recipients in the calculations, even if those students don’t receive the full SSI allotment per individual because of other family income. Our family, for example, makes less in total food and financial income than TANF recipients, but because of the way Income Support counts my income (and doesn’t count the girls as part of the family, even though 1/2 of my income is deemable to them, and they only recieve 1/4 a SSI allotment as a result) meaning they assume about $1000 per month MORE than my family actually receives. When I bring this to their attention, the response is “I know it’s unfair, but that’s our process”. My kids DO qualify for free lunch, because free lunch is TRULY calculated on family income. This is a true case in point of what people are talking about concerning fraud and government assisstance. First, you say you qualify for free lunch and list all the technicalities concerning SSI and TANFand food stamps. However, you fail to mention your gastric bypass surgery, obvious costs of computer and internet service, not to mention the time obviously spent blogging and research of all your options that people like me, taxpayers, who have to work full-time so Uncle Sam can dish out entitlements to other families rather than keep the money we make. Seriously, you seem to have the system down pat; unfortunately guys like me and my family have to work and pay for it. Maybe you should spend more time looking for a job and the rest figuring out a way to support your own family with whats left after the government takes over a third of it! People are supposed to have a stigma attachted to free hand outs- it’s the motivator to do something about it, not just figure out how to get more. It’s called personal responsibility for a reason, and charity for a reason. People are supposed to, on THEIR OWN TERMS and choosing, help out those who are less fortunate- not have the government take it away and spend it for them. These programs are called entitlements to make people who take them not feel “stigmatized”. What a crock! I have a news flash for you, no one is entitled to anything that has been taken away from anyone else- most people call that STEALING. Hi Donna – THANK YOU for your post. Oh yeah…I know why I can’t get a free lunch…I work full time, have made good choices, and pay for everyone ELSE to have a free lunch. “Fab Kate” and others like her have definitely figured out the “Funded By Donna and Elizabeth, and Others Who Work” system. It’s a huge crock pot of you know what. But isn’t SNAP an optional program? If there are more in the lunch program than SNAP program, couldn’t that just be the result of families not taking advantage of the SNAP program (for whatever reason)? Or am I entirely off-base right now? I agree with Lauren…the issue could just as easily be underutilization of SNAP. At my daughter’s school, each child has a little card with money loaded on it to swipe for lunches. There is no way to know if the source of that money is the parents or the free or reduced lunch program. No stigma. In contrast, you have to apply for SNAP. And then you have to pay with food stamps at the grocery store. There is, sadly, some stigma associated with that from some quarters. I would not be at all surprised if there were a number of families earning in the 25-28k range who are happy to fill out the free lunch program paperwork but don’t yet feel desperate enough to apply for SNAP or TANF. And sure, there probably is some fraud, but the mere fact that there is a discrepancy between utilization of these programs does not by itself prove it. You may be right. Due to my husband currently not working and me also losing my job in the forseeable future, I may consider applying for reduced or free lunch to help out until I find other employment, but I would only apply for state assistance as a last resort. I am college educated and employable. No matter how long I have worked and paid my share of taxes, it is hurtful to the pride to think I would ever need to use these services. Five years ago, my husband lost his job. I still had mine but we could have applied for fs. Our house payment was low and we had no other debt. So I did things like cut off the cable, stopped eating out lunches with work friends, etc. and jusgo ought our food with my money, He got a job in five months later and I never had to get the fs. If my daughter was school age at that time, I may have applied for a free lunch come to think of if it would have helped us out. Will do it for them. on the tax payers dime. The poverty level is so high where I live they recently (last year) implemented free school lunches for every student in the district, whether they meet income requirements or not. I am not sure how much money that’s costing, but it ensures every kid gets at least one meal a day (I think breakfast is free as well, but not all kids go to school early enough for that) and saves kids embarrassment because no one is paying for lunch. We’ll see if it lasts. I work for child protective services and one of our problems was families who really needed the free lunches not taking the time to fill out the forms, or not understanding how to fill them out properly. So their kids weren’t eating at all. So personally I think that a few extra kids eating lunch for free isn’t a big deal if it ensures that every kid gets to eat lunch. Because the state where I live draws a direct correlation between students receiving free lunch and poor school performance, in one school where I taught I was given a list each year of the students receiving free or reduced lunches. I remember looking over the list several times and seeing names of families that I knew undeniably did not qualify for the program due to family income (legal or otherwise). But due to extreme corruption in that district, this practice was/is rampant. The blame doesn’t lay completely with the schools on this issue. I know of parents who hide income to qualify for all sorts of programs, and it is disturbing to me. We seem to live in a society where we are not allowed to struggle at all. We’ll find a way to get qualified for the programs we want. What these people don’t realize is they are taking funding away from classrooms and other places where the money could be used more efficiently and for a greater number of students. While I understand that some schools overestimate their free/reduced lunch levels, many of the secondary schools I work with actually under-report. The stigma associated with proving income status, and “being that kid who doesn’t pay”, can be enough to discourage high schoolers from bringing in paperwork and accessing the support. It seems odd to demand that more oversight is needed. How much money would such oversight actually cost? An administrative salary per district? If so, wouldn’t it make a ton more sense to provide high-quality, nutritious lunches for each and every kid? Why not free lunch for every child? Perhaps that stigma of “being the kid who can’t pay” will motivate them to get a job and pay for their lunch like all the other kids. That’s the healthy thing about stigma; it breeds change and improvement through hardship. 20+ years ago when I was in school, my family qualified for free or reduced lunches at school, but did not participate in any other low-income program. My mother did not accept or apply for food stamps, heat assistance, WIC or any other program at that time. I am not sure why she made the exception for school lunches, but she did. We were a family of 9 (with 3 children still at home and in school) that survived on only my father’s limited income. My mother raised a large garden in the summer, and (through canning) this supplemented our meals throughout the year. The thermostat was set low and most everything in our household was second-hand (we didn’t have a color tv until I was in junior high…1983! LOL). There is no doubt that we would have qualified for other programs, we just didn’t take advantage of them. Therefore, by the standards seemingly set forth above, our family would have been evidence of fraud in the school lunch program. A couple of years ago we hit a rough patch and applied for the reduced lunch program. I was amazed that we didn’t have to submit a pay stub, tax return or anything at all that supported the amount of income we claimed. I could have put down anything! We did get free lunch but it turned out my daughter detested the food and said it was the most disgusting stuff she’s ever seen so we never really used it. That really bothers me, but I feel like there is nothing that can be done. I mean I am from a Middle Class family that is not allowed to apply to any kind of assistance as my parents make a specific amount of money, but we have more bills than most of the people on the state supported plans. I think that alot needs to be done to change this so that people that do not need the support get taken off of it and only the desperate people that really need it should get it. Unfortunately,fraud is rampant in many of the public assistance programs. I work in a welfare fraud investigation unit and we see many scenarios that should be fraud, but are not due to loopholes in the rules. However it seems the government is currently in a swing in which individuals should not be held accountable and public assistance rules are made more and more relaxed. As stated in the article the school district is stating that they are only supposed to check a small percentage of the applications received. I believe this is probably an accurate statement as currently the push is “Access to benefits.” Right now in the SNAP program states are actually penalized for not making sure that every household who is eligible receives food stamps, even if the household does not want those benefits. And additional federal funding is provided to states who make sure to increase the population of households on assistance. Unfortunately the rules allow for many household to receive benefits, who may be technically eligible due to loopholes in the rules, in scenarios that many Americans would be appalled to truly understand. Hopefully, in time, there will be a change to ensure only the people who truly need the benefits are eligible for all types of public assistance. As a family that receives reduced lunch I am sickened by this. I have never lied on my applications and was deeply thankful for the reduced rate. To hear that some people lie – cheat and steal – makes me both angry and worried. Worried because if it continues then, I and my family, along with other families who are truly BLESSED by this service will lose it. I wish deeply that the administrators would take the time to verify the applications – they will make more money in the long run if the program continues rather than flash it out now because its extra cash. I can see why people on the borderline would resort to lying – if the limit is $29,064 and your income is $29,065, you may earn “too much” to qualify, but still really need help. And, nice clothes and electronics don’t necessarily mean tons of extra cash; they could have been donated or given as gifts or bought at a thrift store, or they might have been bought two or three years ago and the family’s financial situation has changed since then. On the other hand, if someone really does earn plenty of money to pay for their kids’ lunches, and they’re just lying to save a few bucks, that’s reprehensible. I process the free lunch forms for my school, and sometimes the blatant lying on the form is astounding. Yet if we require one family to provide proof of income, we must require ALL families to provide proof (which is more time-comsuming than one realizes, as no one actually reads the form, or brings in the required documents). And even if you’re audited, it’s not fraud-proof. It’s simple enough: don’t put your husband’s income on the application, and don’t submit his paystub. That being said, there are so many families who need this program that I’d rather approve the liars than deny someone who truly needs it. Numerous times a mother has said to me, “I’m so embarrassed to be doing this. I’ve never in my life been on welfare, but we need this so much right now.” And if someone truly needy is $100 over the limit, I can usually encourage a ‘correction’ to get them under it. It’s fraud and I’ll be fired if the state auditor finds it. I gamble with my job every time I do it but the relief on that mother’s face is worth the effort. My family qualified for reduced price lunches when I was a kid, until my older siblings turned 18. My brother was still living at the home and unemployed and my older sister was 18, had a baby and a deadbeat husband. My parents were supporting both of my older siblings, my sister’s husband, and the baby, along with me and my younger sister. Money was tighter than ever, but we didn’t qualify for reduced price lunches anymore. My mom consistently sent me to high school without enough money to buy full-price lunch and I ended up eating junk from the vending machine because it was cheaper. My diet would have invariably been better if my parents had lied on the application and we had qualified for free or reduced price lunches. On the application, you are supposed to list ALL household members including non working and/or college students…also the baby can be listed because the grandparents support him/her…if the adults have any income, list it..if the adults don’t have income you write 0…the qualification is based on the # of total people in the household along with the total gross income. I wish someone had mentioned this to your family. It breaks my heart as a “Lunch Lady” to think that you went hungry and it wasn’t necessary. I hope this information helps someone though. Gin- This is HIGHLY ILLEGAL. Student information of free and reduced lunch is not to be shared, period. agreed..it is highly illegal..this is very confidential information and the nutrition department can be sued and or fined for disclosing this information..we are only allowed to give a total # of Free/Reduced/Full pay students without any names attached…big trouble!! While I find the idea of lying to receive aid reprehensible, I’m frustrated by some of the classist remarks here. My sister qualifies for reduced lunch and SNAP benefits, but she has a nice car (which our parents helped her purchase) and her children have some of the latest video games (which her workplace donated as Christmas gifts). It’s completely unfair to judge someone’s situation based on what you think they have. Plus, the parents probably go out of their way to provide nice things for their children so that they won’t be mocked as being the “poor kids.” It seems that some people would like to put low-income families into a terrible dichotomy: either you can scrimp and save and find a way to provide nice things for your family (and encounter derision as stealing from the government) or you can buy all your supplies from thrift stores and discount places (and watch your children’s peers mock them for having out-of-date hand-me-downs). As to the difference between SNAP and free lunch, I’m with many of these other posters. My family received free lunch when I was younger but not food stamps. I’m not entirely sure why; I suspect that my dad didn’t want us to spend money that could have gone to help other, less fortunate families. I’m certain that we qualified for SNAP and can remember my parents using the “oh, I’m only skipping dinner because I had a really big lunch” line more than once. We always managed to get by, but I suspect that my family would have required SNAP if we three kids hadn’t been able to eat breakfast and lunch at school. I am a parent of a prekindergartner in NYC. 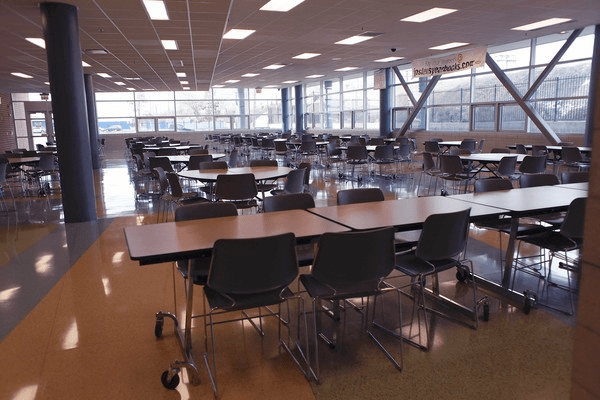 We do not qualify for free lunches but attend a public school where the vast majority of students do- or so it appears. We are required to submit a free lunch form whether we qualify or not and I’ve been told not to put our actual income as the school needs the money from free lunches. I send my daughter’s lunch every day as I do not aprove of the food served in the school, however, she does not eat my food, but the school food which I do not pay for. I’ve spoken to her teacher several times, but she insists that my daughter would be sad if made to eat the lunch her mom made and not the school food like her friends. When questioned about being billed for lunches, she said that no one has to pay for it. It’s a very frutrating situation. I thought that since I cannot control what is served in the cafeteria, I can still control what my daughter eats. I suppose now, I have an even bigger battle. Seriously, fried mozzarella sticks and collard greens is a meal once a week at this school. So uncool! I don’t understand that teacher’s point of view: since when do teachers promote peer pressure and conformity? And what if your daughter had specific dietary needs, and that’s what prompted you to insist she eat the lunch you provide? Plus, think of all the wasted food! I hope you find a solution. I know the teacher can’t stop your daughter from eating school food, but you would think she could find a way to discourage it. I would be in the superintendent’s office so fast that it would make my child’s teachers head spin..if the superintendent didn’t listen, then I would file a formal complaint with the school board…Don’t let other people control what You do with Your Daughter. You are her mother..So don’t let them bully you in to making her eat the school lunch..This is just weird and smacks of fraud!! I see the issue with the mozza sticks…but what’s wrong with the collard greens? So I would like to begin by saying that I have worked since the age of 16 and never been without a job. Made good choices and I have a great job. Up until this year everything was going well, recently my husband was diagnosed with Lymes disease. He has not been able to work for a year now. So this year I applied for reduced meals thinking just until we could pay some of the medical bills down; I make 50,000 a year Net. So we of course didnt qualify. But what they don’t ask on the application is for you to itemize your debt. If they did this… they would have realized that I don’t bring home enough money to cover the bills each month and we are living on credit cards. My daughter eats peanut butter and jelly sandwiches everyday for lunch and my oldest daughter uses her babysitting money to pay for her school lunches. It makes me sad that she uses her money for food. I have decided to write a letter with a detailed list of where the money goes because I only bring home 2400 dollars a month. With a car payment, house payment, and tons of medical bills there should be exceptions. Maybe there are and I just don’t know about them? This is a concern I’ve had, too. When faced with difficult times, I’ve looked into the free/ reduced lunch program, only to find out we don’t qualify. What about those of us who fall into hard circumstances and just need a little bit of help here and there? Tracy, I’m sorry to hear about what your going thru, and hope he recovers! I like your method to show the take home, and hope it works. And I will say a prayer for you and your family! Ahem, all you screeching about how these horrid, horrid people are thieves and how hard you work for every single thing you own and stealing from National School Lunch Program is wrong, you do realize that the “thieves” are hungry kids, right? You want to take food away from children. School lunches are crap and these meals are sometimes the only food these kids get all day and they have to go without on the weekend and summers. Oh, and you know that SNAP (food stamps) is being cut even further and that poor people, many of whom are children, will have to somehow find a way to survive on $1.40 per meal, right? Oh, and how can CHILDREN have made such bad decisions to deserve going without food? I’d really, really love to know that! I just wanted to echo the sentiments regarding not judging people by what they have. My husband and I do not have children and as such, have a little more disposable income than most of our friends. We have frequently purchased expensive gifts for our friend’s children. Whenever I upgrade to a newer model of electronic such as an iPod, laptop, cellphone or gaming system, I give the old one to a friend or their child. Frequently the items look brand new as I am meticulous with my things. It never occurred to me that others may be judging my friends because of my gifts. I just wanted them to have something fun or make use of something I no longer needed. Correction: I’m talking about items that children are bragging about getting when they get their “tax check.” Items that just came out a week or so ago. When students come to school with items worth thousands of dollars but can’t afford a school lunch (yet have more than the cost of lunch daily to blow in the school concession stand)? Oh, and by the way, a student’s free/reduced status is indicated on standardized tests. It’s a bubble to be filled in on the front cover. So much for confidentiality.